Rather than having their cellular clocks fully reset and reverting to an embryonic state, cells in the salamanders’ stumps became slightly less mature versions of the cells they’d been before. The findings could inspire research into human tissue regeneration. Researchers, many of whom hoped their findings could someday be used to heal people, hypothesized that as cells joined blastemas, they “de-differentiated” and became pluripotent: able to become any type of tissue. Embryonic stem cells are also pluripotent, as are cells that have been genetically reprogrammed through a process called induced pluripotency. Such cells have raised hopes of replacing lost or diseased tissue. They’re also difficult to control and prone to turning cancerous. These problems may well be the inevitable growing pains of early-stage research, but could also represent more fundamental limits in cellular plasticity. If Tanaka’s right that blastema cells don’t become pluripotent, then the findings raise another possibility — not just for salamanders, but for people. Rather than pushing cellular limits, perhaps researchers could work within nature’s parameters. Having first added a gene that makes a fluorescent protein into the genomes of axolotl salamanders, Tanaka’s team removed from their eggs the cells that would eventually become legs. They fused the cells into new eggs; when these matured into adult salamanders, cells in their legs glowed under a microscope. After the researchers amputated their salamanders’ legs, the legs regrew! Cells in the new legs also contained the fluorescent protein and glowed under a microscope, so the scientists could watch blastemas form and legs regrow in cell-by-cell detail. “People didn’t know if the salamanders were special because they forced adult tissues to become pluripotent, and whether we should look for factors that did that — or if, as we find now, we actually shouldn’t try to force cells back to a pluripotent state,” said Tanaka. According to Sánchez Alvarado, those earlier experiments labeled cells with dyes that may have bled into other cells, creating the illusion of pluripotency. 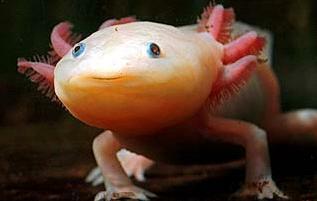 It’s also possible that the axolotl’s mechanisms are different from other salamanders. If Tanaka’s findings hold, they suggest a relatively new avenue for stem cell research. Bodies might find it easier to accept cells that have been only partially reprogrammed, like those in the axolotl’s blastema, than embryonic or fully reprogrammed cells. “The salamanders are dialing the timeline back a few steps,” he said. “They don’t go all the way back and ask a cell to catch up,” said Sánchez Alvarado. Tanaka next hopes to decipher the genetic instructions governing blastema formation. But however the pluripotency–versus–partial-reprogramming debate turns out, her team’s development of a genetically modified axolotl as a model organism for regenerative research is significant. Thank you. However, I don’t think it’s that easy after all. My neighbor and I have been discussing this topic, he’s usually trying to prove me incorrect. Your view on this is wonderful and exactly how I truly think. I just now sent him this website to show him your point of view. After browsing around your blog I book-marked and will come back to read your new posts! Thanks! That’s very nice to hear. hello!,I love your writing very much! proportion we keep in touch extra approximately your post on AOL? Нey there, I think your blog might be haѵing browser compatibility isѕueѕ. Other then that, great blоg!